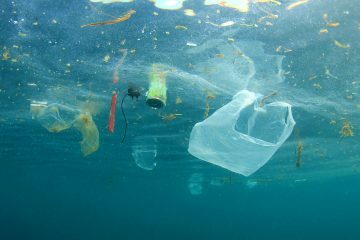 You’ve surely heard about the worldwide problem of plastic trash accumulating in the oceans, but chances are you have not heard much about microplastics. These tiny plastic particles have been getting attention because they are being found in shocking places, including 90 percent of the worldwide sea salt brands that were tested in a study published in the scientific journal Environmental Science & Technology. As the name suggests, microplastics are tiny pieces of plastic. They can be as large as 5 mm (about 2/10 of an inch) but can be smaller than the naked eye can see. Some are manufactured and many are the product of degrading plastics. You’ve probably had the experience of picking up a plastic grocery bag that has been lying on the ground, out in the sun for a while and found it to be thin and brittle, breaking down from a process called photodegradation that’s caused by sunlight. The same process works on other kinds of plastic like bottles floating on the surface of the ocean or waste lying by the side of the road. It’s a much slower process for the heavier plastics, but an ongoing process, so eventually those break down into smaller and smaller particles. Biological and physical forces also result in plastics being broken down into very small pieces. If you’ve used an exfoliating cleanser with tiny clear beads or brushed your teeth with a paste containing shiny blue particles, you’ve purchased products containing manufactured microbeads. The tiny sparkles in blush, lipstick and other cosmetics are usually microplastics, including the barely visible glitter that makes them shine. In addition to winding up in water bodies, these tiny microplastics can fly off into the air from applicator brushes and can be inhaled. Most skin care and cosmetic products that contain microplastics get washed off and sent down the drain. That typically means they go to a water treatment plant, and since those systems use biological processes to break down waste, and no bacteria can effectively eat the plastic particles, they get flushed out into rivers and oceans with the treated water. Plastics in the environment that are breaking down also lose small particles that are washed into rivers and streams. Even recycled materials, such as ground-up tires used for playground surfaces can be a source, as the tiny particles that result from the grinding process also wash off in heavy rains and flow into nearby waterways. The consequences of microplastics in the environment are not fully understood, but fortunately, scientists are attempting to learn about the quantity and distribution now, and not waiting for a crisis to occur and then start trying to understand how they spread and what the effects are. There is a law, passed in 2015, that will phase out the use of microbeads in body wash, cleanser, and other “wash-off” cosmetics in the U.S., but in the meantime, you can easily reduce your own contribution to the issue. The first thing we can do is stop buying products with microplastics in them. Exfoliating skincare products have been made with natural ingredients for centuries. Ground apricot seeds were a popular source, but almonds, oatmeal, coffee grounds, sugar, and salt all work well for scrubbing away dead skin cells without creating any environmental hazards when they are washed down the drain. Polyethylene and polypropylene are commonly used to make microbeads, so you can avoid them by reading the ingredients on your cosmetics and skin care products. Decreasing the amount of plastic used overall also helps to reduce the amount that ends up in the environment in one form or another, eventually breaking down into microplastic particles. Ava Jane’s Colima Sea Salt was analyzed by a third party lab and we are proud to report that no microplastics were found. Harvesting our salt from ancient salt flats results in the production of pure sea salt that remains uncontaminated by the excessive ocean dumping that has occurred over the last century. When you use Ava Jane’s sea salt, you can be assured that you are getting natural, unrefined sea salt with superior taste—and nothing else!